Despite its acquisition by Acer in 2008, it is only in recent months that Packard Bell has begun to release a stream of highquality new mobile products. The latest release is the EasyNote LJ75-JO-080UK, a stunningly cutting-edge, high-powered multimedia centre. Powered by Intel Core i5 technology, performance is excellent. Frequent and demanding multi-tasking is easily possible, with all our test software opening quickly and running smoothly and reliably. This level of power is continued on the graphics side. Using a dedicated ATi graphics card, performance is great with enough power on hand for most graphics heavy tasks. Whether playing the latest games or editing high-definition (HD) video, there is ample power on offer here for all multimedia requirements. The large 17.3-inch widescreen panel provides a stunning canvas for this power, with impressive brightness, colour and contrast combining with deep black levels for eye-catching images. An HDMI port lets you connect to a larger HDTV when required for a full multimedia experience. Unfortunately, for such a capable multimedia machine, Blu-ray support is notably absent. DVDs and CDs can be accessed, however, and the 500GB hard drive is ideal for holding tens of thousands of photos, videos and songs. All this power would be useless without a good user interface, so thankfully the EasyNote delivers well. While the keyboard doesn't span the full width of the chassis, the tapered keys are large and accessible, making typing a pleasure at all times. While the black and silver chassis design isn't the most stylish we've seen, it creates a sleek look for the home or office. The chassis also feels pleasingly resilient throughout and is sure to take the knocks of regular family use. Inevitably for such a large and high powered machine, mobility takes a backseat. At 3.2kg, you won't want to carry this machine far. There is a surprising 199 minutes of battery of life on offer, however, for working around the home. Equally useful is the high-speed network connectivity on offer. 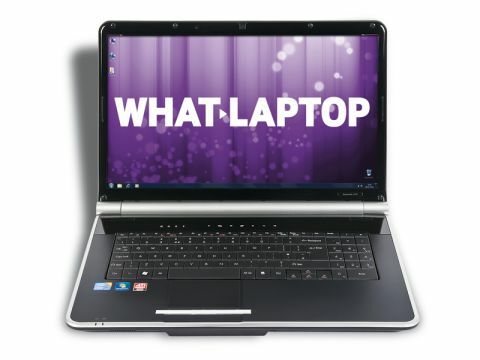 Gigabit Ethernet and 802.11n Wi-Fi provide the fastest possible wireless and fixed connections, rounding out the specifi cation of this powerful consumer laptop. Using cutting-edge technology for stunning performance, the EasyNote LJ75-JO-080UK is one of the best machines you can buy at this price. Add its vibrant screen, great usability and feature-packed specification and you've got a fantastic laptop for the whole family.